Going to grade school in Mt. Vernon, New York, I was a good student focusing on academics until my neighborhood changed almost overnight. Low income projects were built a block away and Jews fled the hood rapidly. We could not afford to move so we stayed and my education took a different turn. Surrounded by peers who wanted to be cool, I wanted to be cool too. As a result, I spent time combing my hair and listening to rock and roll instead of focusing on my studies. Over a period of several years in a junior high school of average achievers, I became average. No longer at the top of my class, I became one of the cool guys. I remember vividly going into the school restroom with Ernest, a buddy, and styling my hair just like Elvis, slicked back with a curl dangling in front. Hormones were raging and Ernest and I wanted to look good for the girls. It wasn’t until my high school years and my being “born-again” as an Orthodox Jew that I firmly realized that the most fulfilling way to lead a life is to be yourself, to think of larger issues than personal appearance, and not to construct a life determined by the expectations of peers. I finally understood that my goal in life should not only be to be liked, but to be holy, a goal of a totally different order. I was reminded of this as I watched Zelig, the story of Leonard Zelig, a man whose only purpose in life is to be liked by others. It is an all-consuming goal, which even has physical consequences. If he is with Chinese people, he becomes Chinese and can even speak the language; if he is with people of color, the actual color of his skin changes; if he is with physicians, he becomes a doctor who can speak the medical lingo. He becomes whoever he is with. Through a protracted psychoanalysis with Dr. Eudora Fletcher, we learn that Zelig morphs into whoever he is in order to protect himself emotionally. When alone with himself, he has no identity. The film traces Zelig’s journey towards personal self-actualization, which occurs because of the love of one person who deeply cares for him, who validates him, who thus enables him to change his life: Dr. Eudora Fletcher. This notion that a person who knows that he is loved feels valued is a Jewish sensibility. Parents understand this almost intuitively. Rabbi Akiva in the Talmud used to say that “Beloved is man, for he was created in God’s image. It shows even a greater love when God informed man that he was created in His image.” If we know God made us in His image and loves us, we feel special; and that is very good for us emotionally. Because we are all created in God’s image, all of us have infinite value. Moreover, God created the world, say our Sages, with only one man. This teaches us that one life is equivalent to the entire world. None of us is a mere number. Each one of us is an entire world. 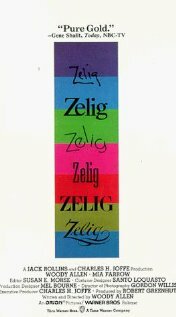 Zelig reminds us that ultimately we achieve very little in life if all we do is imitate others. The key to emotional maturity and progress lies in our very individuality, in our ability to understand how we in our own special way can contribute to and enrich the world around us by being who we are, by celebrating our divinely-given uniqueness.